Of the many legends told about the Arabian horse, that of the Bloody Shoulder is one of the most popular. At least, that’s the case in the West, because to date I have found no Arabic version of it. While this color mutation can happen in any type of horse (and appears in various coat colors) it is frequently seen in grey Arabian horses, thus providing the fuel that keeps the legend burning brightly. 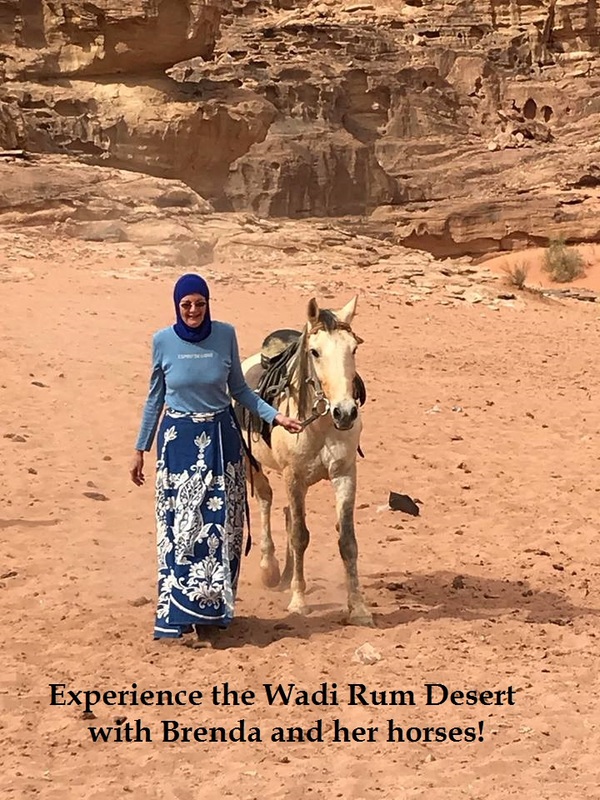 Like so many other stories, this one is also set in an unspecified time amongst the Bedouin and within the space of the desert, all concepts perceived as being closely connected to the identity of the Arabian horse. 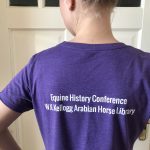 On closer inspection of this legend, it’s still not immediately clear precisely how the tale of the Bloody Shoulder should have become so firmly established and so popular amongst today’s Arabian horse community. The modern version of the story of the bloody shoulder appears to date back no further than 1982. In this tale, which first appeared in print in Arabian Horse World, a Bedouin chieftain is surprised by a group of robbers while riding on his mare through the desert. 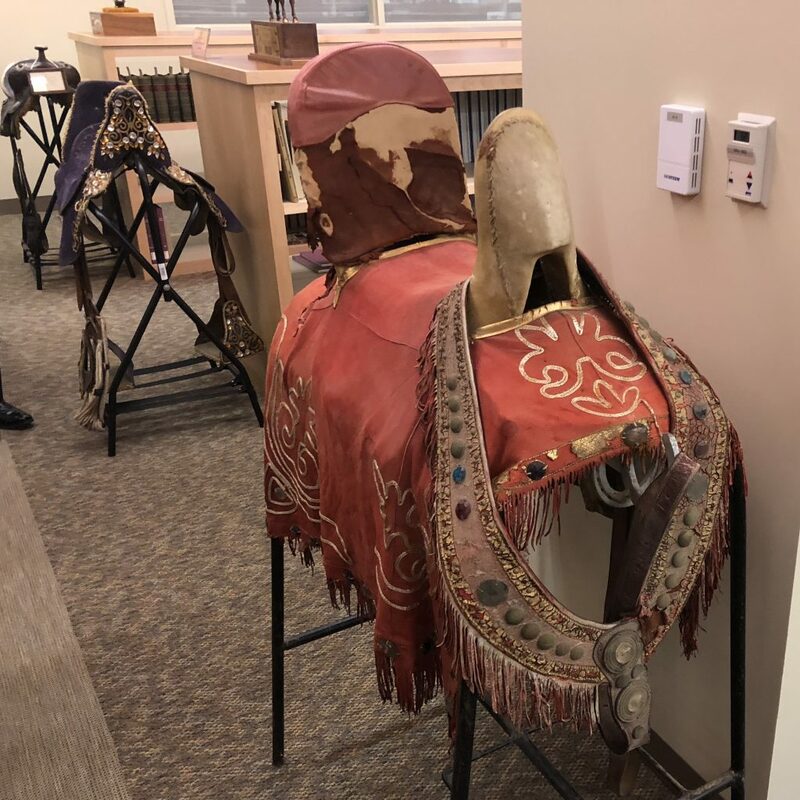 The robbers open fire and although his mare runs for their lives, a bullet pierces the heart of her rider, causing him to slump forward onto her shoulder and neck. The mare keeps going and doesn’t stop until she has returned her master to the camp they call home. There, his people take his lifeless body off her back to discover a large bloodstain that has dried on her shoulder. That same night the mare foals a colt who has the same mark on his shoulder as his dam, and ever since it is believed that every horse carrying a bloodlike stain on its shoulder descends from that very brave mare. Although it is not possible to pinpoint the exact source of the legend, the story itself resembles that of a very old Shia Islamic ritual that is still found today: the mourning of the death of Hussayn ibn Ali on the Day of Ashura. Commemorated primarily among Shia Muslims in India and Pakistan, the death of Prophet Muhammad’s grandson is mourned during processions that include a horse. 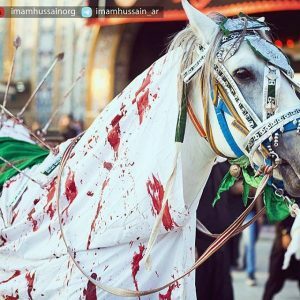 Mostly white horses are used, to represent the grey stallion that is said to have carried the wounded Imam Hussayn away from the battlefield and back to his camp. Another striking similarity to the story of the Bloody Shoulder is the fact that the rider, in this case Hussayn, was also shot in the heart, causing him to fall forward on his horse. 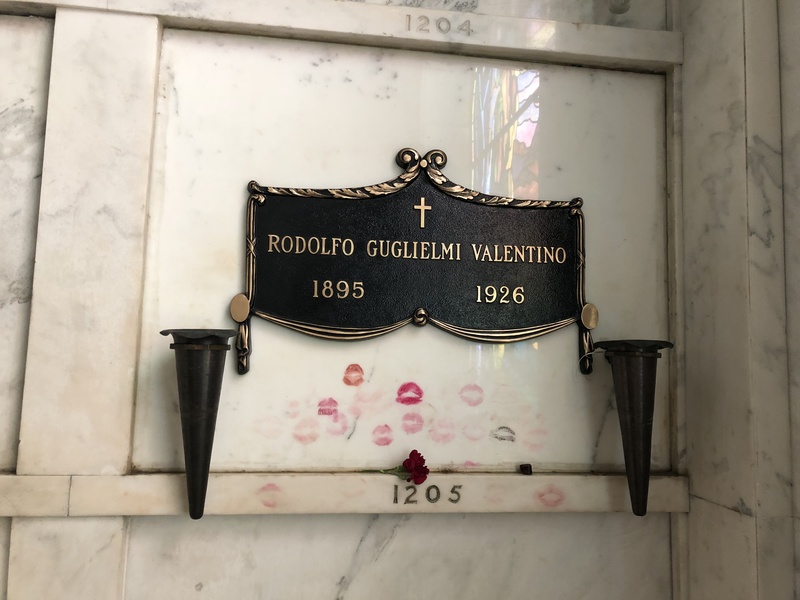 During processions, the horses are smeared with red paint to look as though a rider has bled on them and often wear sheets with arrows attached, to emphasize the bravery of the horse that brought its rider home despite the rain of arrows or, in the case of the modern legend, bullets. 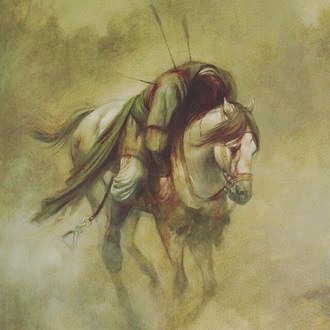 Whilst there are different versions of the role that the horse played during and after the death of Hussayn, the horse is always hailed as a hero, much like the horse in the legend of the Bloodied Shoulder. Maymun, Hussayn’s grey stallion, is praised so highly that he even receives a new name; Dhu al Janah, Owner of Wings. 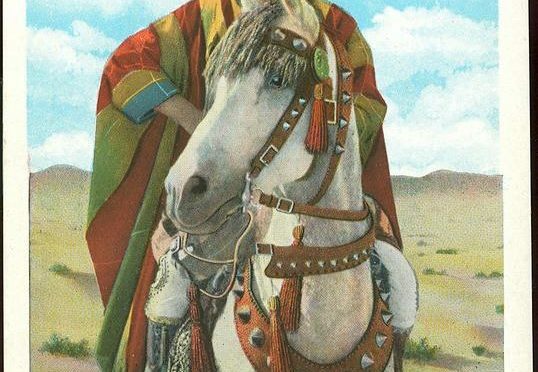 Not only is he celebrated by poets and in processions, some rumors even try to connect the winged horse to Prophet Muhammad himself, claiming that he was in fact the stallion al Murtajiz. This horse is said to have sat down to let Hussayn mount him as a child, a detail returning in the Dhu al Janah tradition where the stallion lowered himself to gently release the wounded or slain Hussayn from his back. 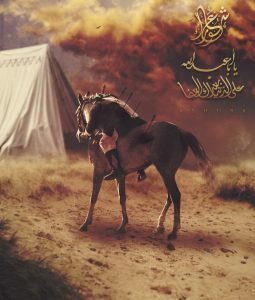 Although it’s very appealing to believe that the two horses were one and the same, al Murtajiz would have had to be at least 54 years of age at the battle of Karbala, after which Hussayn passed away. 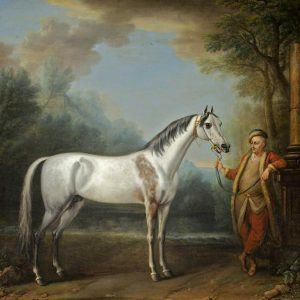 Because of the similarity of the two tales, it might be possible that one derived from the other; and the introduction of the story into at least the English language may have focussed on one special horse: the Bloody Shouldered Arabian, a stallion imported into England in 1719/20 from Aleppo. Was this then the colt who provided the inspiration for the modern legend? On the one hand it doesn’t seem very plausible, as in a letter from Nathanial Harley, who shipped the horse to his brother Edward Harley, it is explained that the stain on the horse was “red as blood” when he bought him,but faded as he aged. But, on the other hand, the story may have boosted interest in the stallion among other breeders in Britain. The first lead in English literature to the story of Hussayn’s death I found in the work of historian Edward Gibbon (1737-1794). It surprised me how his lifespan so closely paralleled that of Shia poet Hassan al Damastani (d. 1759), who wrote a poem about the battle of Karbala, titled Dhu al Janah. Gibbon does not mention any horse in his version of the tale but refers to his source: Simon Ockley (1678-1720). Although Ockley does not pay special attention to the character or name of the horse in his very long description, he may have been the one to transfer the story into the world of Arabian horse breeders as he exchanged letters (1714) with Lord Harley, the last owner of the Bloody Shouldered Arabian. Perhaps the one is not the source of the other, but both stories are legendary, adapted to early modern orientalism; in the latter, modern version, the horse became a mare to fit the romantic image of Arabs and the Bedouin, and perhaps also to insinuate in some way that the stallion was in fact the colt born to the mare. 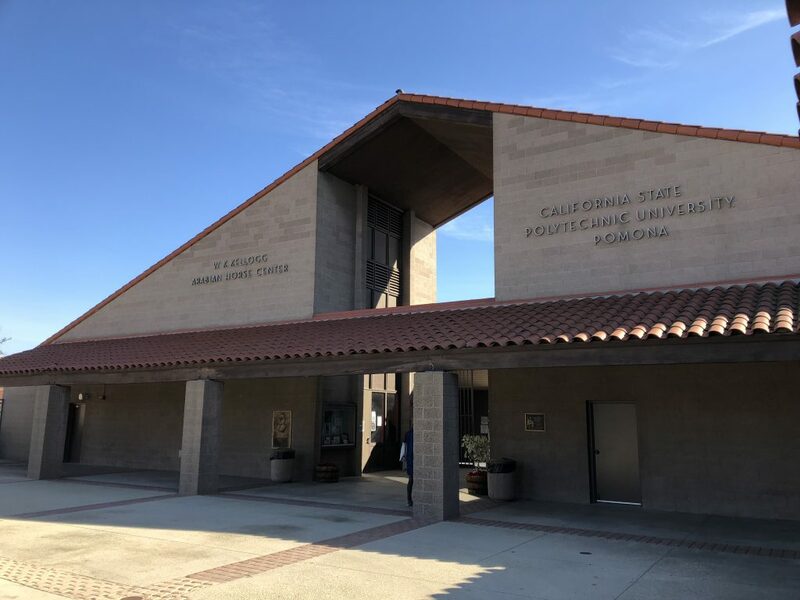 While it is not absolutely certain whether or not the two stories – that of the Bloody Shouldered Arabian and the heroic horse with wings – are indeed connected, it is certainly a possibility. Both these legendary tales are known in several different versions and the horse in question is celebrated. Furthermore, it is very interesting that Hussayn’s horse is now known as Dhu al Janah rather than Maymun. The idea of giving the horse wings may be related to the important position Hussayn holds within Shia Islam, much like the mystical creature Al Buraq that Prophet Muhammad rode during his visit to the heavens. Although Al Buraq is not a horse but composed of various animals, he is usually depicted as at least part horse and having wings. Assuming it was understood that Dhu al Janah also had a mystical aspect to his being, it is possible that the story of the Bloodied Shoulder was regarded in similar fashion. The legend was then perhaps adapted to a more tangible and appealing setting for the interested European public, a Bedouin Arabia, possibly to help promote the stallion with the bloodmark on his shoulder. 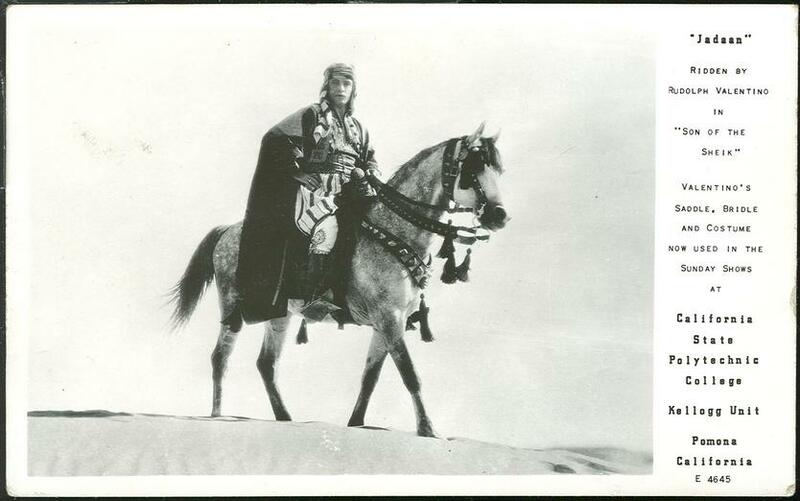 In order to further convince the public, the role of the hero was now shifted from stallion to mare because the Orientalists had met Bedouin with a tradition of riding mares into battle. 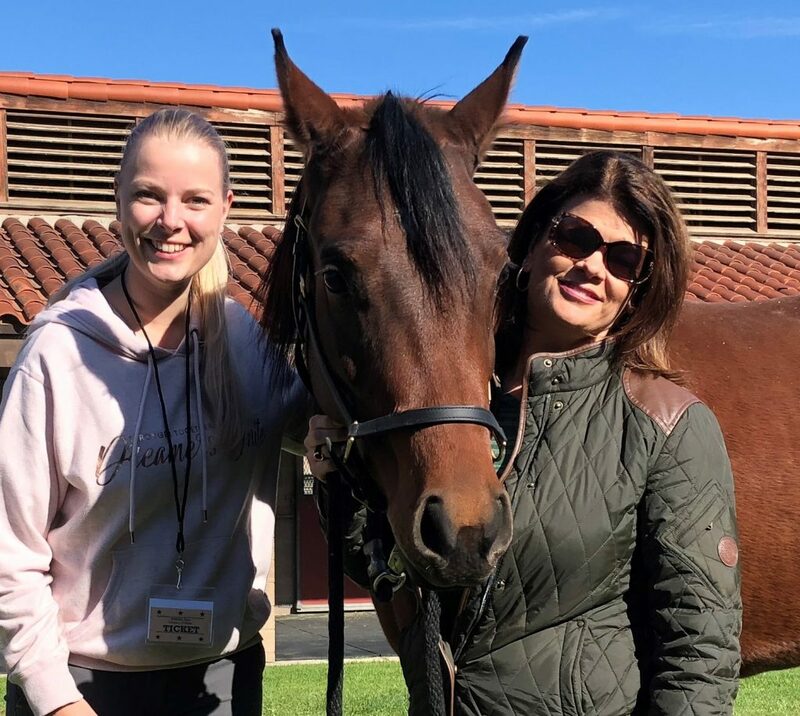 If the legend was to help promote the stallion it may have also helped people overcome the fact that he had a “strange” color and was somewhat odd, not fitting in with existing views on attractiveness in horses.